Fragrant and beautiful, lavender has been a part of gardens for decades. Whether you are just looking for a new variety for your bed, or needing more information on its many uses, The Lavender Lover's Handbook will show you the way. I love lavender. As my gardening skills have grown these past years, this is one plant I always make sure to have. While my planter at my old apartment thrived with huge blooms, the plants that are now in my flower bed are small and woody. Needless to say I was thrilled to pick up this title so that I could learn more about it. Sarah Berringer Bader has turned her her own passion for this herb into a successful career growing and selling them through her business, Lavender at Stonegate. I knew there were a lot more types than the Grosso I have picked up at the local nurseries, but Bader highlights 100 varieties, giving details on how the plants deal with weather and planting conditions. Other practical notes such as recipes for culinary use and dried crafts show that Bader has a broad understanding of this versatile plant. Terrific photos throughout showcase landscapes and herb gardens, where lavender adds a more than just its namesake coloring: dark blues, bright pinks and white all intermingle with a full range of purples. You can even find lavenders that are bi-color, green or silver. 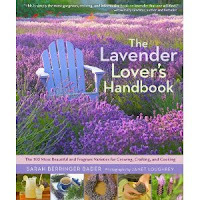 A field guide, growing guide and craft guide all in one, The Lavender Lover's Handbook has something for anyone who loves this plant.